This website is protected by copyright. © 2011 The Stour Gallery, unless otherwise stated. Site content is not to be copied, modified, distributed, published or made available on a network without the prior written consent of The Stour Gallery. All other rights reserved. Please feel free to establish a link to this site from your site, provided the context is relevant and the link or its description is not detrimental to the business of The Stour Gallery. All links to this site must go to the homepage. Please do not link directly to any other pages on this site. While we have taken every care to compile accurate information and to keep this site up-to-date, The Stour Gallery makes no warranty as to the accuracy or applicability of any information on this website and cannot accept liability for any errors or omissions. This website is intended for viewers from the United Kingdom. Those who choose to access this website from other locations are responsible for compliance with local laws. The Stour Gallery have included some relevant links for your information and convenience only. However as we have no control over these third party links, we cannot accept responsibility for the contents or reliability of the linked sites. The term “The Stour Gallery” used in this Legal Disclaimer, except where stated otherwise, shall be deemed to include The Collection, its employees and affiliates. All use of the website http://www.thestourgallery.co.uk/ ('the Site') is on the terms and conditions below. The Stour Gallery ('we') do our best to ensure all information on the Site is accurate. Any views expressed in messages on the Site are not necessarily those of The Stour Gallery or anyone connected with it. 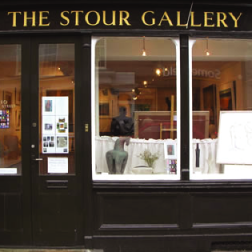 The Stour Gallery and http://www.thestourgallery.co.uk/ and our logos on this site are trade names of The Stour Gallery. You may not use those names without our consent.